What is the cost of a Networking Education? Graduate your networking to a higher level and double or even triple your business that comes from referrals. Live sessions throughout the year at various Georgia and North Carolina locations. Here’s what you need to know… who should attend, topics covered, class size and more! “I have increased my networking ... my revenue has gone up at least 50%..."
Want More Profits With Less Work? How much is a networking education worth to you? A college degree comes with a hefty price tag and these days a job is by no means guaranteed when you graduate. What if you could graduate your networking to a higher level and double or even triple your business that comes from referrals? Word of mouth marketing is powerful and growing exponentially thanks to the ease of connecting thru social media such as Facebook, Twitter, LinkedIn and YouTube. You can harness this power with a focused referral marketing strategy. 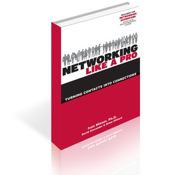 Networking Like A Pro: Turning Contacts Into Connections is a #1 bestselling, practical guide to effective networking. Based on this book, the Allstars program is an 8 classroom sessions course followed by two personal referral coaching sessions. This comprehensive course is divided into 4 Quarters (like an Allstar game) and will provide you with all the tools you need to create and implement a broad referral marketing strategy. In fact, you will begin implementing your plan during the 1st Quarter! To have an abundance mindset and participate in the law of reciprocity. Understand how social capital is a true measure of how successful a person becomes. The tools to be more intentional in your networking. Understand and use the Relationship Scoreboard to track your networking activities. Understand and use multiple channels to build your relationships. Have a complete Networking Like a Pro referral marketing game plan. Understand the value of developing profitable referral sources. Have 5 to 8 profitable referral sources identified and a plan for establishing these connections. Understand how to more accurately target your ideal customer and meet the needs of those customers.